At 8:45 p.m. Brasília Standard Time, I sent Ryan O’Hanlon an email. 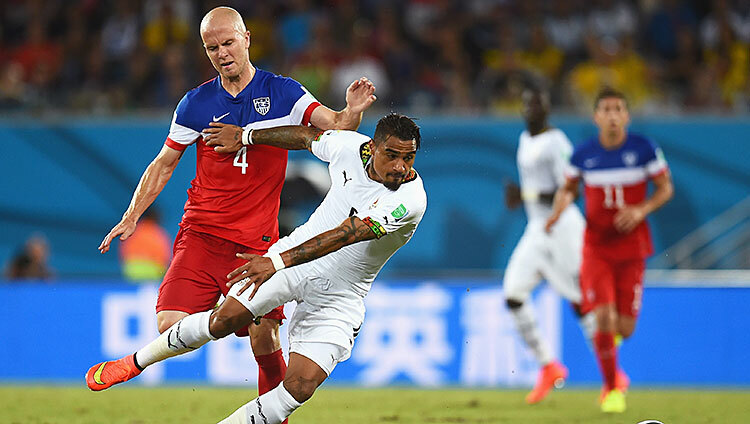 It read, in its entirety: “I think the U.S. gets a late winner.” The United States men’s national team had just given up an equalizer to 24-year-old Ghana forward Andre Ayew, after getting run over for most of the 81 minutes that followed Clint Dempsey’s goal 29 seconds into the game. Now, an email such as the one above is very easy to drag out when you are correct. No one remembers the bold predictions you make that don’t come true. But it really did feel like something had changed in Arena das Dunas after Ayew scored. It felt like the U.S. remembered they were supposed to come out and play instead of trying to protect a tenuous one-goal lead for 89 and a half minutes plus stoppage time. Jurgen Klinsmann, whom midfielder Kyle Beckerman credited with “seeing the future,” thought so, too. You know what happened next: After Fabian Johnson managed to win a corner kick, Zusi, a second-half substitute for Alejandro Bedoya, jogged over the corner flag and delivered the corner kick that John Brooks — the youngest American World Cup scorer since Landon Donovan — sent into the back of the net. “He’s what, 6-foot-6? He’s a pretty good target,” Zusi, the Sporting Kansas City midfielder, said of Brooks during a post-match interview, allowing himself a brief smile because, you know, his assist had just won a freaking World Cup game. Great. 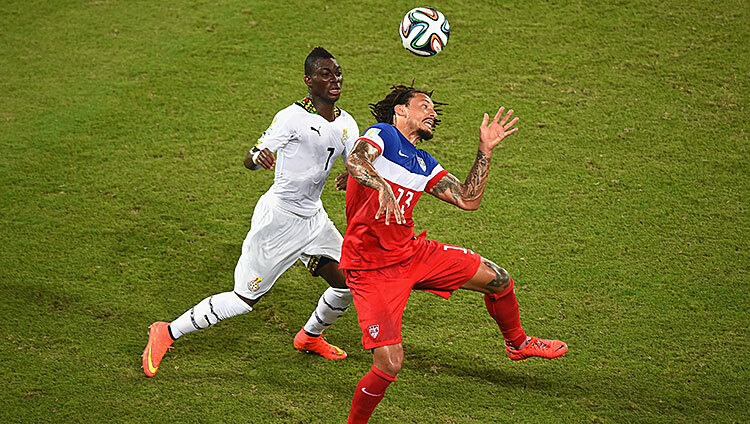 The Americans needed three points against Ghana, and they got those three points. But wow. Can we talk facts? Michael Bradley wasn’t good. He missed passes he normally completes, made bad decisions with the ball, and generally looked about as un–Michael Bradley as possible. (Honestly, I didn’t even really think it was possible at this point.) While the midfielder still played the safety-blanket role for his teammates when they had the ball, and was positionally smart, he failed to make anything happen. He looked a step slow and out of sorts. The lack of eloquence in my description of his play mirrors his performance on Monday evening. This, combined with the paragraph above, now puts us in bizarro territory. Herr Fouls-A-Lot was a slide tackling, challenging, and — key here — smart-playing force of nature. With Klinsmann deploying Bradley and Kyle Beckerman in the middle, Jones was playing out left, but also seemingly everywhere he needed to be to break up play at the last minute. The midfielder tempered his temper, restrained some of his worse impulses, and, during the last month, has had some of his best performances in an American uniform. The final tally came in 59-41 in favor of Ghana, but it felt like the U.S. didn’t have the ball for long stretches. After the match, both Klinsmann and his players either intimated or said outright that this was the plan: let Ghana have the ball and the wings while not letting them go straight up the middle or beat defenders in one-on-one situations. Tactically, it worked. The Black Stars took plenty of shots (21), but most came from distance, and only eight found the cage. We’re telling a different story if a few of those crosses hit their targets, but let’s give the U.S. coaching staff credit for recognizing Ghana’s weakness in that area (and the American aerial strength). Giving Ghana the ball makes some sense. More concerning was the USMNT’s seeming disinterest in keeping the ball when they won it back. They were looking to counter — Klinsmann said he saw opportunities on the break — but played too quickly, mishitting pass after pass. Part of the issue was Bradley’s uncharacteristic struggle; part was just general incompetence. Portugal and Germany will punish such sloppiness. Jozy Altidore looks like he might be done for the tournament. He had tears in his eyes after a hamstring injury forced him off, replaced by Aron Johannsson. The American-born, Iceland-raised striker has many talents, but “target man at the World Cup” is not one of them. While the coach downplayed Matt Besler’s removal at halftime as “precautionary,” the center back was limping after the match and said he’ll find out more on Tuesday. • Asamoah Gyan makes 50 times more than Matt Besler. 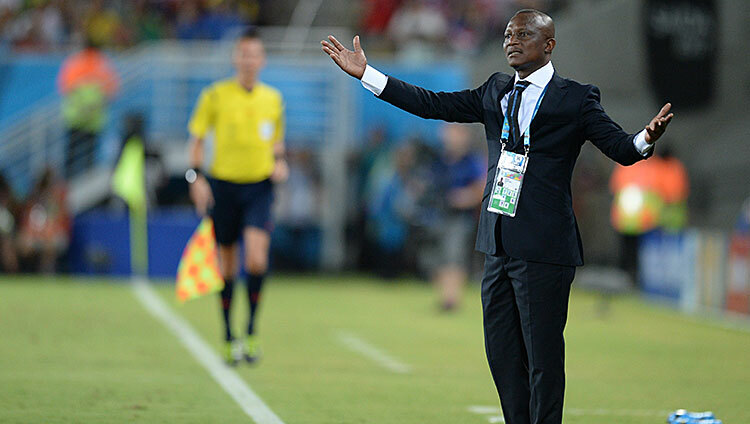 • Ghanaian coach Akwasi Appiah can really wear a suit. We’re back, and moving forward. The U.S. victory, combined with Germany’s 4-0 thrashing of Portugal, sets the Americans up to advance into the next round. Another win will put them through, as will two draws. Even a tie with Portugal and a loss against Germany will give them a good chance to reach the knockout stage. But no one expects the next match to go smoothly.